Our layers are a part of our family and we treat them as such. They are free-ranged every day and are only indoors at night for their protection or during inclement weather. The girls give us such amusement, clean up the yard of bad bugs and seeds, and treat us with delightful eggs. When we have excess, we offer them to you for your enjoyment. We post availability as we have them. 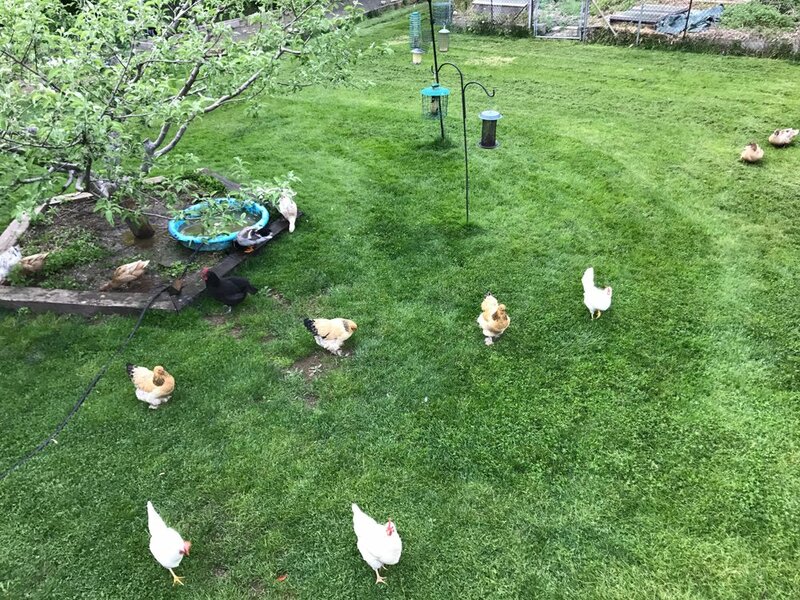 Our hens are happy and healthy and vibrant, flapping around chasing each other, scratching for bugs and worms and seeds, bathe in the dust and dirt, and sunbathe under the warm rays when and where they choose. When they see us they come running, knowing delicious food scraps are coming for them to pick through. Their egg yolks are a vibrant yellow, standing tall, and tasting incredible. Worried about your cholesterol? Don't be. These girls put out a healthy egg that is good for your body. If we are unable to provide our own chicken eggs we source from Andrews Farm; family members who own and run a laying hen operation on the land we grow some of our crops. At this time, we are no longer maintaining a duck flock. We hope, one day, to live on the farm and raise these amazing animals again. Until then, we will source all of our duck eggs from Old Mac’s Farm. The hens are well taken care of and live the life of luxury in the woods and in their swimming pool. Ducks are exceptional devourers of ticks, slugs, and bug eggs. Duck eggs are incredibly good for baking and eating alike. Their shells are hard and their yolks firm and tall.